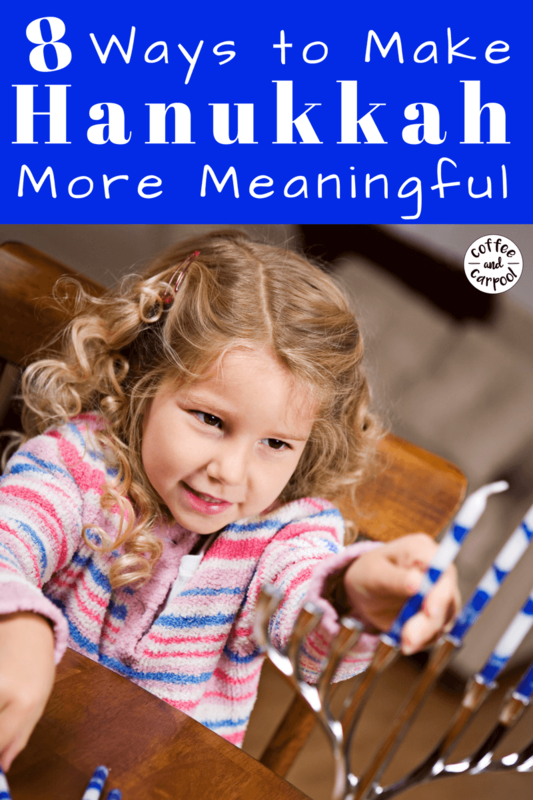 Inside: Are you looking for ways to make Hanukkah more meaningful for your family? 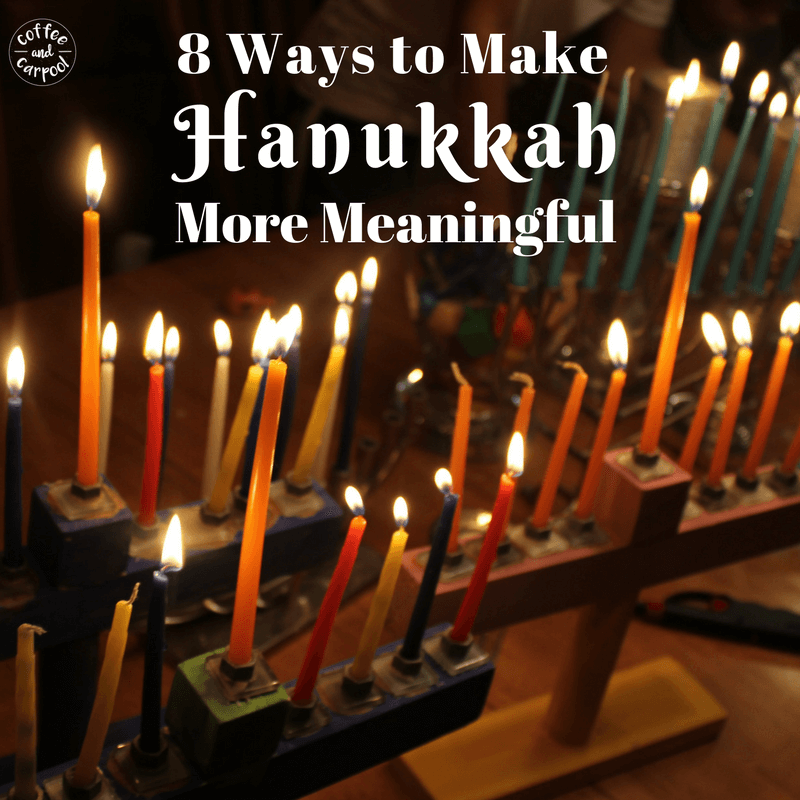 Whether you’re an interfaith family or just celebrate Hanukkah, these 8 ideas for the 8 nights of Hanukkah will make the holiday more special and more meaningful. My dad dropped me off at Hebrew School and as I got out, he gasped. I was still wearing the Christmas sweater I had worn to school. I sheepishly handed it over to him as he drove away. I’m a nice little Jewish girl who also happens to celebrate and love Christmas. And now my kids celebrate both holidays too. We light the menorah and put up a Christmas tree. We make my very religious great-grandma’s Christmas sugar cookie recipe with my mom’s Hanukkah cookie cutouts. And I hang dreidel ornaments on my Christmas tree. We blend it and mash it all up. But Hanukkah can easily get overshadowed by Christmas traditions of carols and Santa and Christmas lights. Hanukkah gets a tiny end cap at Target rather than 12 aisles that are up before Halloween is over. There isn’t a radio station that plays Hanukkah songs starting in November. There’s definitely no hilarious Hanukkah movies I have to watch or a sweet Hanukkah ballet I take my kids to every year. And there’s no way the Mensch on the Bench will ever be as cool as the Elf on the Shelf. Hanukkah will never compete with Christmas. It’s not intended to. 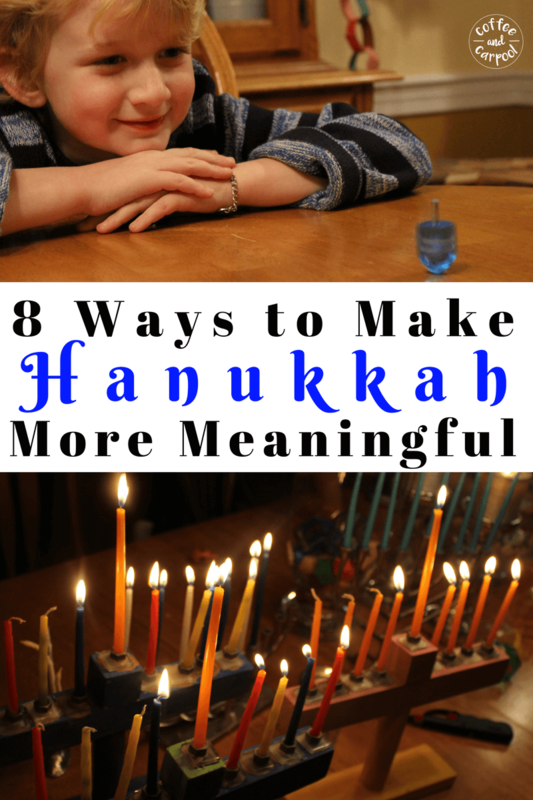 But, I want to find ways to make Hanukkah more meaningful, more memorable, and more special. So on those 8 days of Hanukkah, my family refrains from most things Christmas to focus on the Festival of Lights. To celebrate our December miracle. 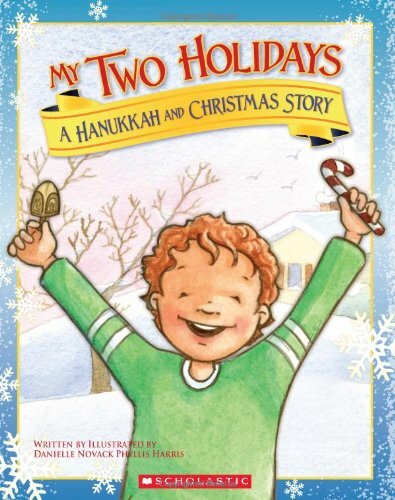 To instill our Jewish traditions in our kids. 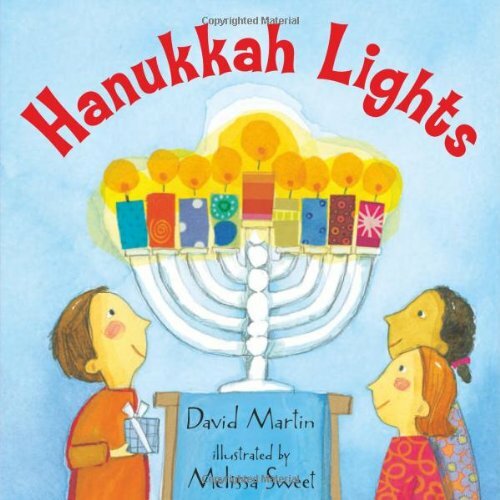 When my kids were younger it was easy to forget to the light our menorah every night. Life was busy and we were treading water to get through the day. But now that my kids are older, there’s no way they would let me forget. If you don’t have kids reminding you, an easy way to remember is to keep the menorah on the kitchen table for 8 days. Don’t have a menorah yet? There’s a Hanukkah in a kit that comes with everything you need to get started! 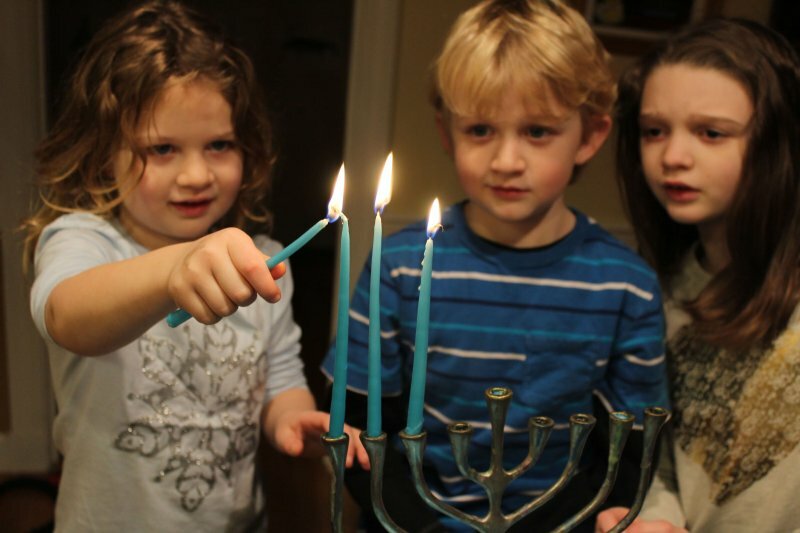 As soon as we felt comfortable, we let our children light the menorah. And they always rotate who gets to pick out the candles and put them in. Our other big challenge is lighting the menorah when we’re not home. Before we discovered this awesome pocket travel menorah we take with us (it uses birthday candles! ), we would pack candles and a tub of Play-doh. My daughter would roll the play-doh into 8 little balls and one slightly bigger ball and we had a kid-friendly on-the-go menorah. We’ve lit our on-the-go menorah at friends’ houses, the mall food court, and even Disneyland. Eight presents can get out of hand quickly, so the presents are often small or shared. They usually get the newest Disney movie, a new board game, or a new Hanukkah book. One year they got marshmallow roasters for our new fire pit and then got impatient for an actual fire. To focus on the spirit of giving, my girlfriend has her kids choose a gift at the store they donate to a local toy drive instead of receiving a present that night. 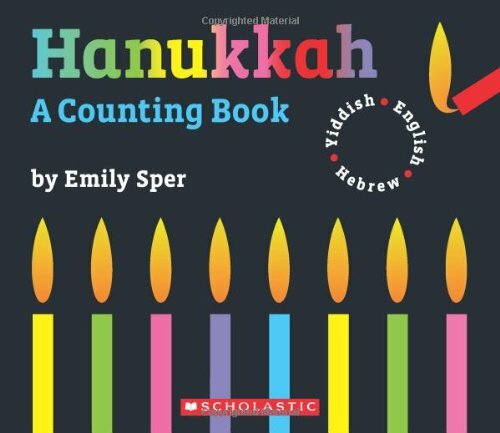 There are so many incredible Hanukkah books, especially with the introduction of the PJ Library (get free Judaica books mailed to you every month!) 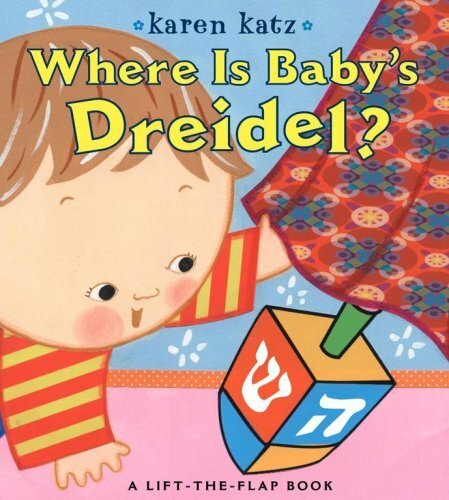 We read at least one Hanukkah book every night of Hanukkah. Plus these books make excellent Hanukkah gifts. 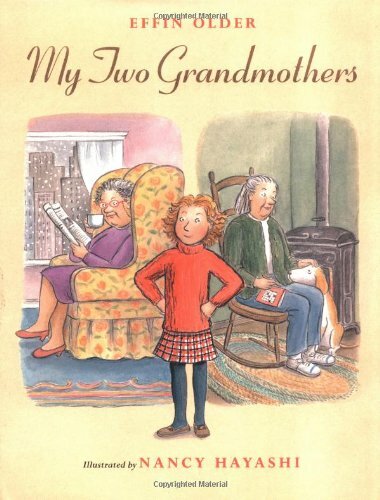 For more book ideas and Hanukkah gifts, click here. I have an obscene dreidel collection. I have wooden ones and hot pink plastic ones and a baseball one. It’s ridiculous and gaudy and I love it. Maybe it’s because I get so excited when I actually find them in stores, I feel the need to buy them all up. Not sure how to play dreidel? Here are the instructions. If you have older kids, teach them how to spin a dreidel upside down. It will get them to stop flipping bottles and try a new skill. Or you can see who can spin the dreidel the longest. Hint: the heavier wooden ones usually win. People who don’t know about Hanukkah are often confused by it. 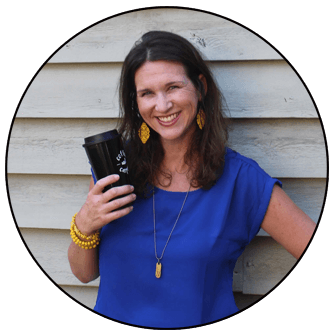 I firmly believe it is our job to help teach others who want to learn how we celebrate. Information helps reduce indifference and bigotry and hate. Information teaches tolerance, and understanding, and love. So we invite neighbors and friends over every year who don’t celebrate Hanukkah. If I’m feeling ambitious, I make latkes. But we teach everyone how to play dreidel and we light all the menorahs we own. The kids who come, leave with their very own plastic dreidel and it’s always the hit of the party. 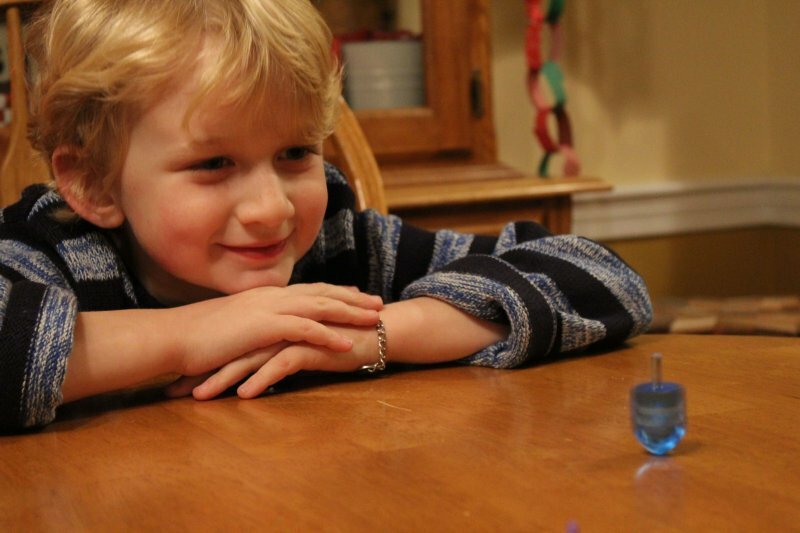 Offer to teach the dreidel game in your kids’ classrooms. Many teachers welcome the chance to showcase cultures from around the world. The year we lit our menorah at Disneyland, a mom at the other table asked if her son could watch so he could learn a little bit more about Hanukkah. Um, absolutely. Your kids will most likely not be coming home with any cute Hanukkah crafts from school. My kids never have. So we make our own. We’ve made Lego menorahs, handprint menorahs, and salt dough ornaments with Hanukkah cookie cutters. 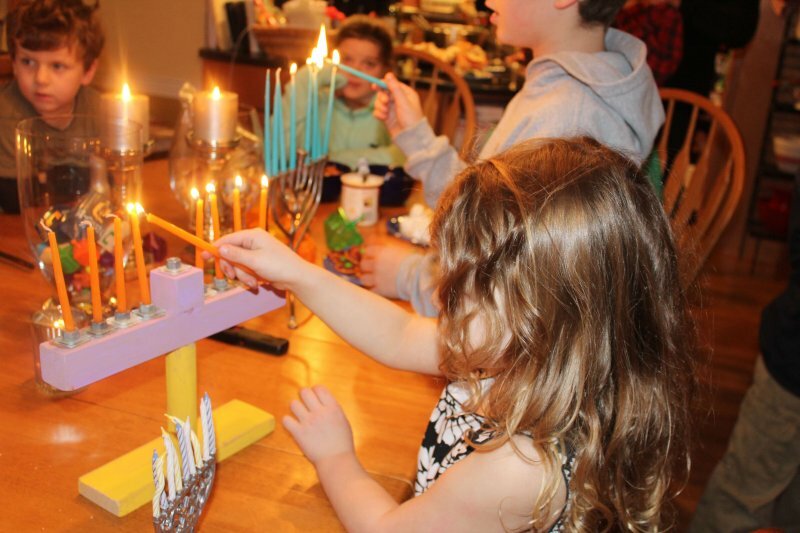 One year I gave my daughter a candle making kit and we used those beeswax candles in our menorah. We’ve also painted these wooden dreidels and we’ve decorated a board to catch the wax drips from our menorah so we protect our table. And one year, we went to Home Depot and made menorahs out of wood, nuts, and small tiles. 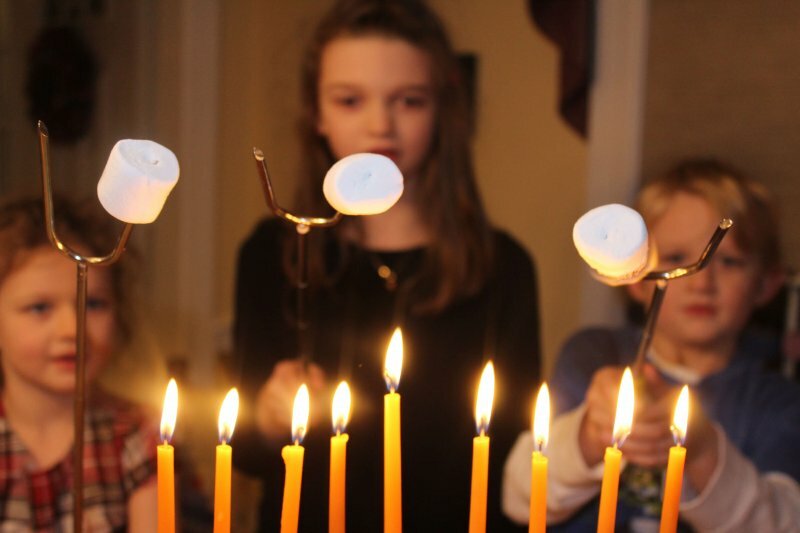 Jewish holidays are all about the food, and Hanukkah is no exception. 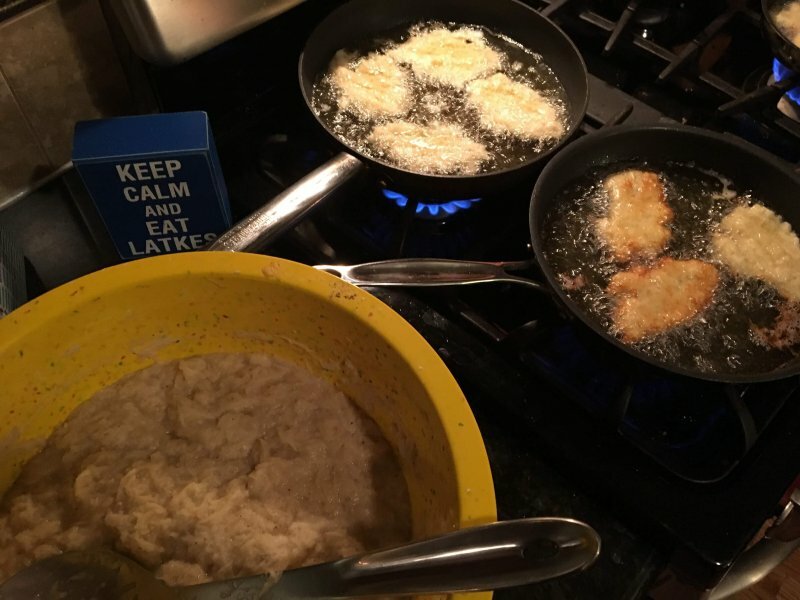 Not sure how to make latkes? Here are a few recipes you can try. We also used to make jelly donuts at home until we found a food allergy safe donut shop to buy them. My kids love eating sufganiyot to celebrate like the Israelis do. We’ve made marshmallow dreidels, fig newton dreidels, and menorah shaped sugar cookies with blue frosting. Because we have to make sure Hanukkah tastes good. I’m listening to Christmas carols as I type this. No really. I love Christmas carols. And they’re everywhere. 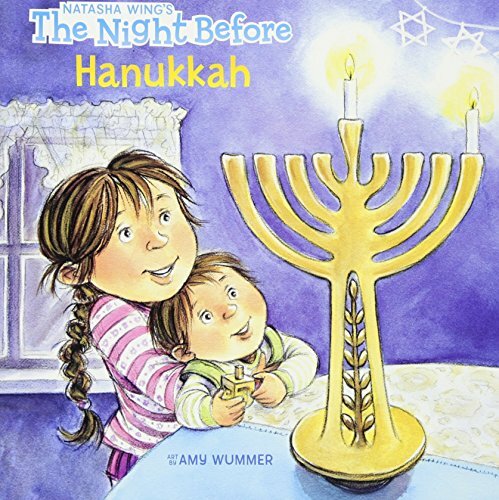 So to balance it out, we make sure to also play great Hanukkah songs so our kids get familiar with and love them too. We now live in a neighborhood where there are very few Jewish families. But being so far away from our family, it’s important to connect with others who celebrate Hanukkah too. We make sure to light our menorah over Facetime at least one of the 8 nights so we’re lighting our menorah with our family across the country. If you live closer to family, invite them over and throw a Hanukkah dinner. If you don’t want to make dinner and deal with the latke frying, light the menorah together. Search your town for a Hanukkah festival. The local Chabad usually hosts one that is open to the community. Attend your temple’s Hanukkah party or check to see if there’s a menorah lighting at your mall or town center. Surrounding myself with the Jewish community always makes me feel more connected to Hanukkah itself. And surrounding yourself with people who believe what you believe and celebrate what you celebrate is a joyous way to enjoy the Festival of Lights. Many families give eight nights of gifts to their children. We do. Small trinkets, books, a family movie. But instead of 8 nights of gifts, we take one night off and give instead of get. 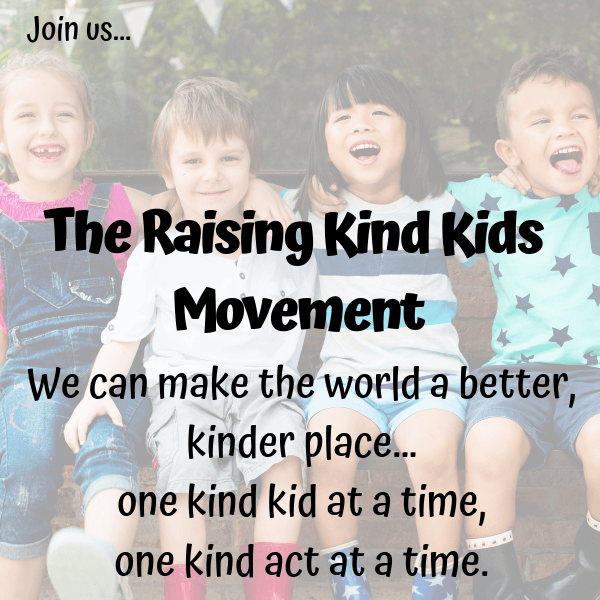 On one of the 8 nights, instead of giving our kids a present, we help them figure out a way to give back. As a family, we choose a cause near and dear to our hearts and give in a meaningful way. Not sure what to choose? Try one of these ways to give back. As a family, you can purchase things for a shelter or on a children’s hospital wish list or buy groceries for the food bank. It can be small, it can be big. But the act of giving is more important than getting one more small trinket. And it sure beats the Mensch on the Bench. Here’s a list of over 70 gift ideas to celebrate Hanukkah. 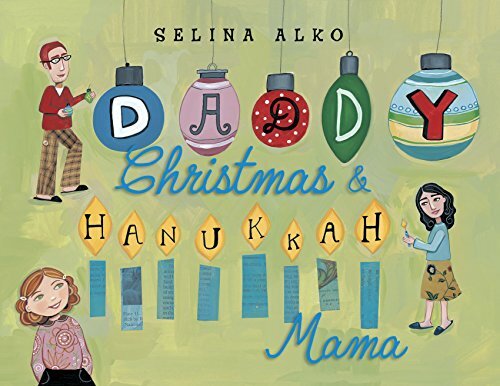 Do your kids get Hanukkah gifts? 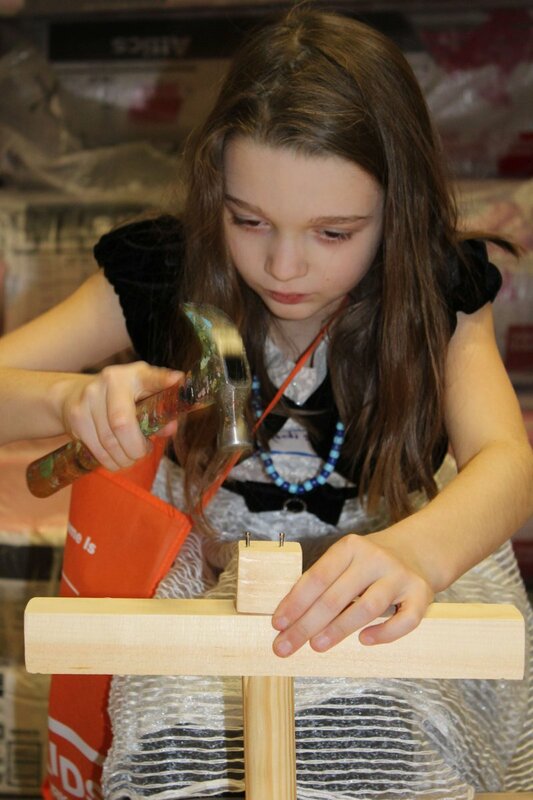 Help them write meaningful thank you notes for their new gifts! Thanks for writing this – it’s all about the original traditions! As someone who celebrates only Hanukkah, it can be tough reading an entire magazine full of Christmas ideas, and when there’s finally something for Hanukkah, they mess upon something that should have been easy to check up – such as inventing brand new Hebrew letters for the dreidels 😉 I loved this post! I hear you! I celebrate Christmas and I still get annoyed about how little Hanukkah gets in the world. Love these ideas! 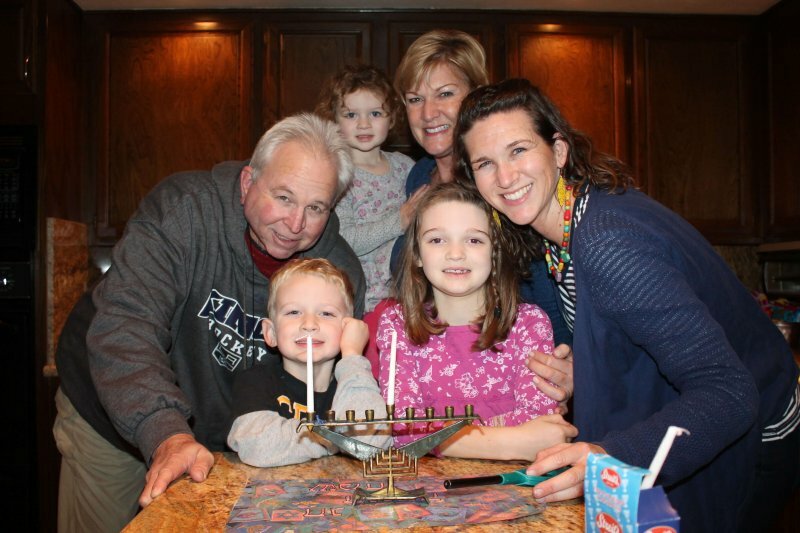 Thanks so much for sharing your Hanukkah traditions. I too am a Jewish girl who celebrates Hanukkah but loves Christmas lol so I understand where you’re coming from. Happy holidays to you and your family.